At SEMrush, we know that every minute counts in the fast-paced world of Social Media Marketing. That's why we've recently added a major usability improvement to our new Social Media tool - the scheduled email reports feature. You can now schedule your reports to be delivered via email when you want them, where you want them. This new feature currently supports the Overview, Audience and Engagement reports, but we plan on adding functionality for the Activity report as well in the very near future. Click on the gear icon in either the Projects interface or the Social Media tool's interface and select 'schedule email reports' from the list. 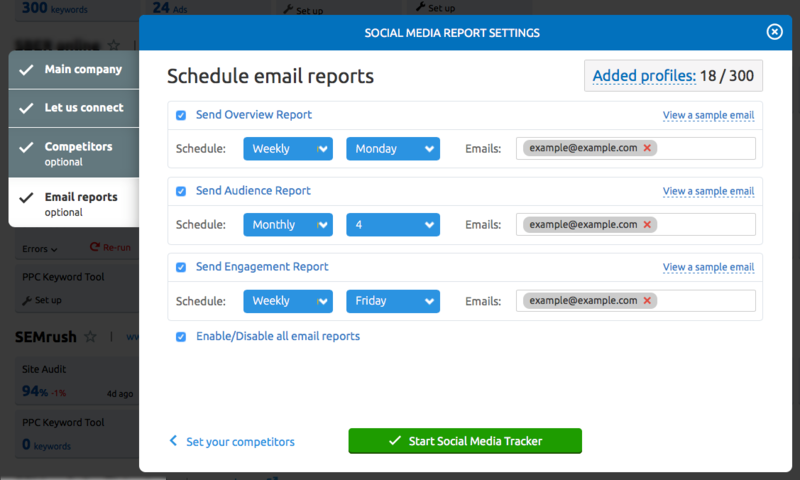 With the update, whenever you configure a new Social Media tool campaign, scheduled email reports settings will be added as an additional step in the tool's set-up wizard. In the Social Media Report Settings, you can choose the supported reports you want to be automatically sent to your email by ticking the checkboxes next to them, or by simply choosing to enable or disable all email reports at once. You can also schedule your reports to be delivered either weekly or monthly and specify multiple recipients. What's particularly nice is that you can view an example of how an email will look like by clicking on the 'View a sample email' button. When you're done configuring the email reports settings, click the 'Update' button - this will immediately apply all the changes you've made. As always, we would love to know what you think of this update. Please send your comments, suggestions and ideas to [email protected]. Thank you for making SEMrush better!